Celebrating the life of Pastor Elton Bynes Sr.
Be the first to share your favorite memory, photo or story of Pastor Elton. This memorial page is dedicated for family, friends and future generations to celebrate the life of their loved one. 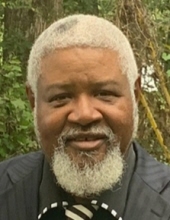 Obituary for Pastor Elton Bynes Sr.
A Time to be Born: Pastor Elton Bynes Sr. was born on May 25, 1955 in Alachua County, Florida to the Late Mr. Wilbert and Annie Lee Bynes Sr.
A Time to Learn: Elton attended North Marion High School Class of 1974. A Time to Love: Elton and Joyce were joined in Holy Matrimony on November 7, 1973. A Time to Live: Elton was currently employed at Briar Patch farm (31 Years). During his leisure time he enjoyed outings with his wife and watching Westerns. But most of all preaching the word of God. He also ministered in Abaco and Pesca de altura, Bahamas. A Time to Die: Elton was called home to be with the Lord on January 11, 2019. He leaves to cherish his memories, a loving wife and Co-Pastor, Joyce Bynes; children, Deacon Elton Bynes Jr. (Nicole) of Ocala, FL., Vickie Bynes, Victoria Bynes, Joycelynn Bynes all of Citra, FL. ; Sisters, Betty Franklin (Robert Deceased) of Hawthorne, FL., Wilina Joyce Rutledge ( Primus) of Ocala, FL., SyBrenda G. Johnson of Hawthorne, FL., Cathy Thomas (Wilie)of Orlando, FL., Wanda G. Williams (Richard) of Orlando FL; Brothers, Orion Bynes ( Diedre), Wilbert Bynes (clara), Lendell Bynes (Angie Deceased) all of West Palm Beach, FL and Cornell Sherman of Grand Rapids, MI; 17 Grandchildren of which two preceded him in death: Aurbrie Bralin Williams, Devin Jamal Barron; Godchildren, Pastor Brian McIntosh, Lorisa Morley and Laura Nichols Strickland; Long Time Friend, Lassie Thompkins owner of Briar Patch Farm and a host of loving nieces, nephews, cousins, and friends. To send flowers or a remembrance gift to the family of Pastor Elton Bynes Sr., please visit our Tribute Store. "Email Address" would like to share the life celebration of Pastor Elton Bynes Sr.. Click on the "link" to go to share a favorite memory or leave a condolence message for the family.